Served to us by a friend in Hobart, Tasmania, this soup surprised me with its good flavor and texture. Very easy and quick to make, and I won't nag you with how good it is for your health. The second time I made this soup, I threw in 1/2 cup finely grated raw carrot, that I had left over from making a carrot cake. Add the carrot just before you purée and serve the soup. No more cooking required. You are looking for texture, not mush. Heat Olive Oil in a large soup pot. Stir fry over High heat until the Onions soften, being careful not to burn the Onions and Garlic. Don't stop tossing the vegetables or they will burn. Add Chicken Broth and bring to a simmer. Turn the heat to Low and simmer until the Cauliflower and Broccoli are tender but not mushy, when pierced with a fork. Add the Milk and grated Carrot if you are using it. Remove pot from heat, and use a hand held blender or upright blender to purée the soup. Serve hot in broad soup bowls, with Parmesan Cheese on the side for a garnish. From The Joy of Cooking, first published in 1931. My edition was printed in June, 1972. Sometime during the 1990's, The Joy of Cooking was re-written. I found it a big disappointment. The new Joy of Cooking omitted numerous recipes that are not available in other cookbooks. This is one of those recipes. I usually make a woven lattice crust top, so that the juices can ooze and bubble up between and over the lattices. Make dough for a double-crust 9″ pie. Pre-heat oven to 450 ° F (230 ° C). Line a pie pan with pie crust dough. Fill the pie shell with the berry mixture. Cover with crust or lattice and bake in a preheated 450 ° F (230 ° C) oven for 10 minutes. Reduce the heat and bake at 350 ° F (175 ° C) for 45 minutes to 1 hour. Cool on a rack until comfortable enough to handle. 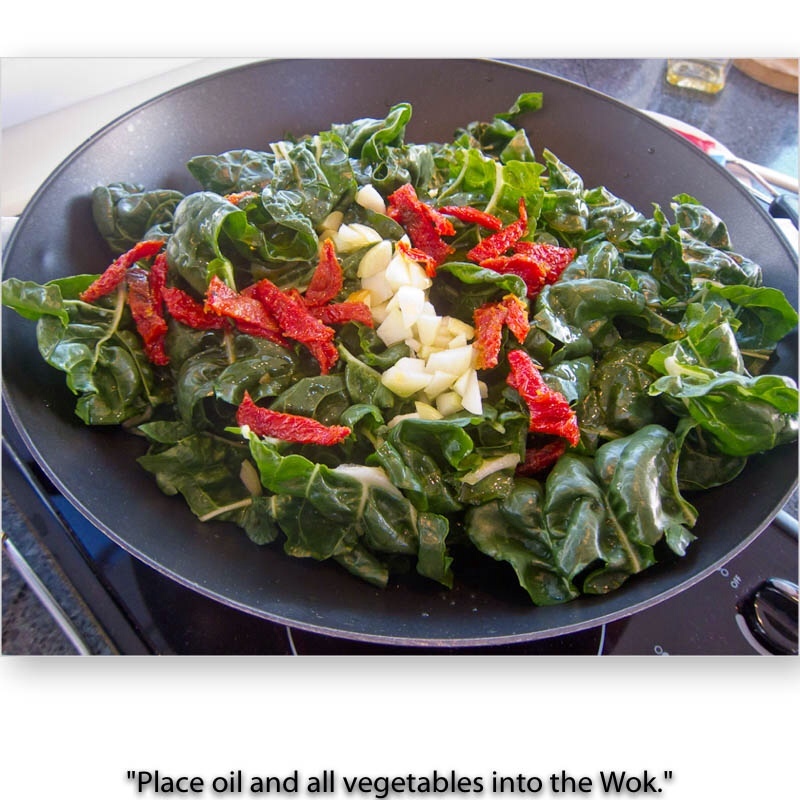 This recipe shows how I use my Wok to make perfect vegetable dishes. 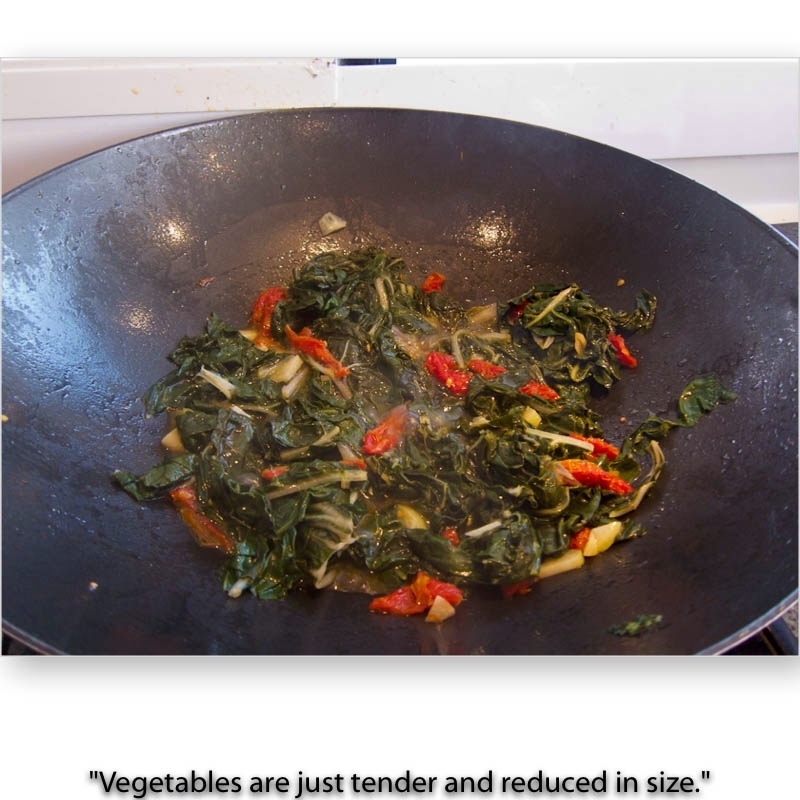 The basic concepts for Wok-cooked vegetables are: (1) Fresh vegetables sized to cook evenly, (2) High heat, (3) Oil, (4) Stir-fry technique, (5) Steam with chicken broth. One of the main benefits of this technique is that you can taste the vegetables at any time while they are cooking, and stop the cooking as soon as they are tender, but not yet mushy. Pour the flavored oil into the Wok. Cut the ribs out of the leaves of Swiss Chard, wash them in a bowl of water, drain, and cut into strips about 2 inches wide. Place into the Wok. Add the remaining ingredients to the Wok and turn the temperature up to High. 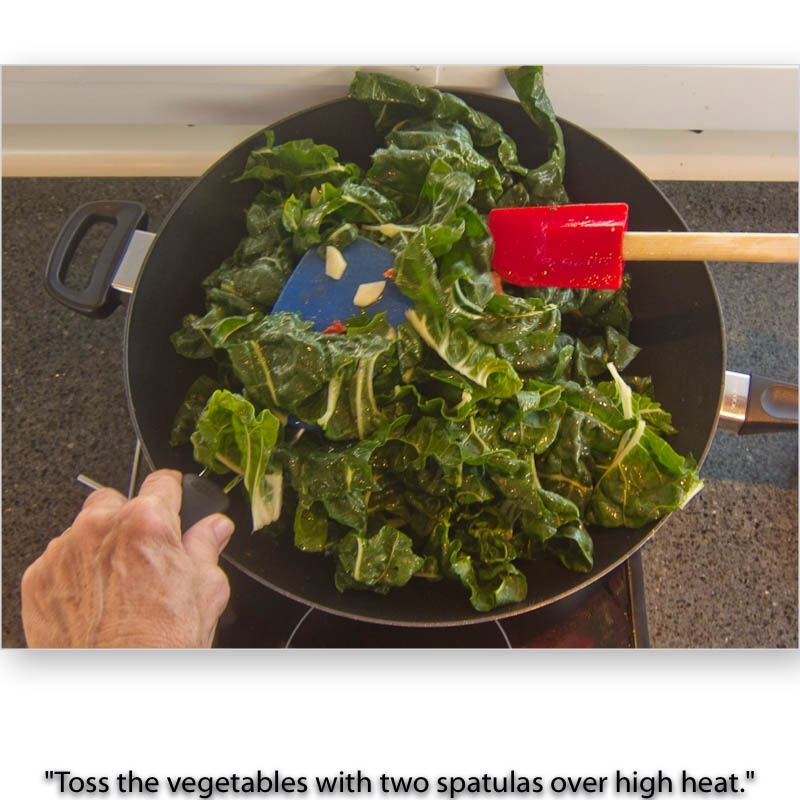 Using 2 spatulas or a spatula and a wooden spoon, toss the ingredients in the Wok until all the leaves are covered with oil, and continue to toss as the Swiss Chard heats, cooks and slowly shrinks. 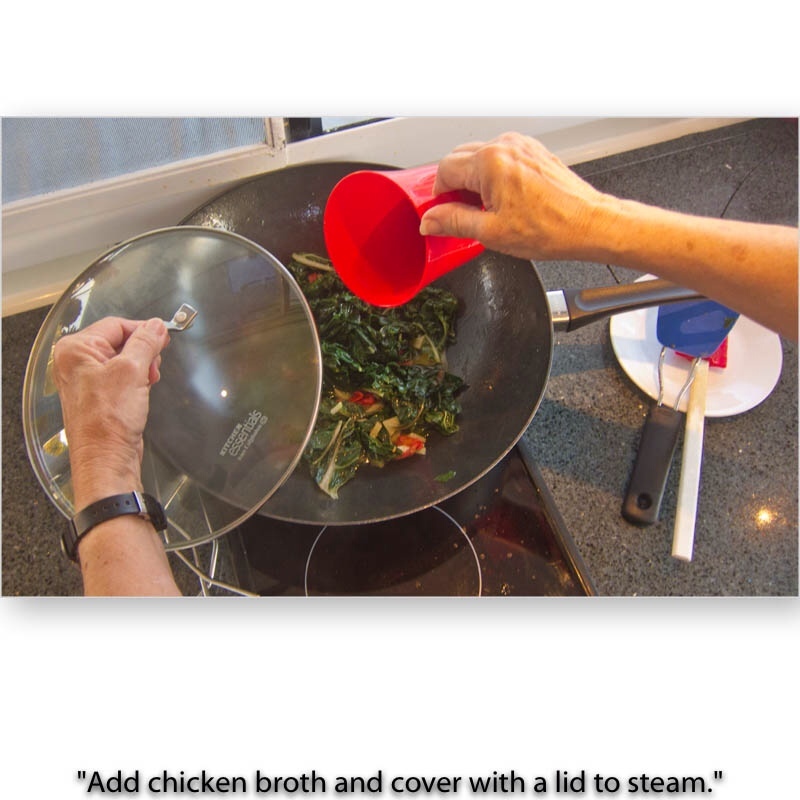 When the Swiss Chard is about 1/2 its original volume, pour the Chicken Broth into the Wok and cover with a lid. Turn down the heat to Medium High. 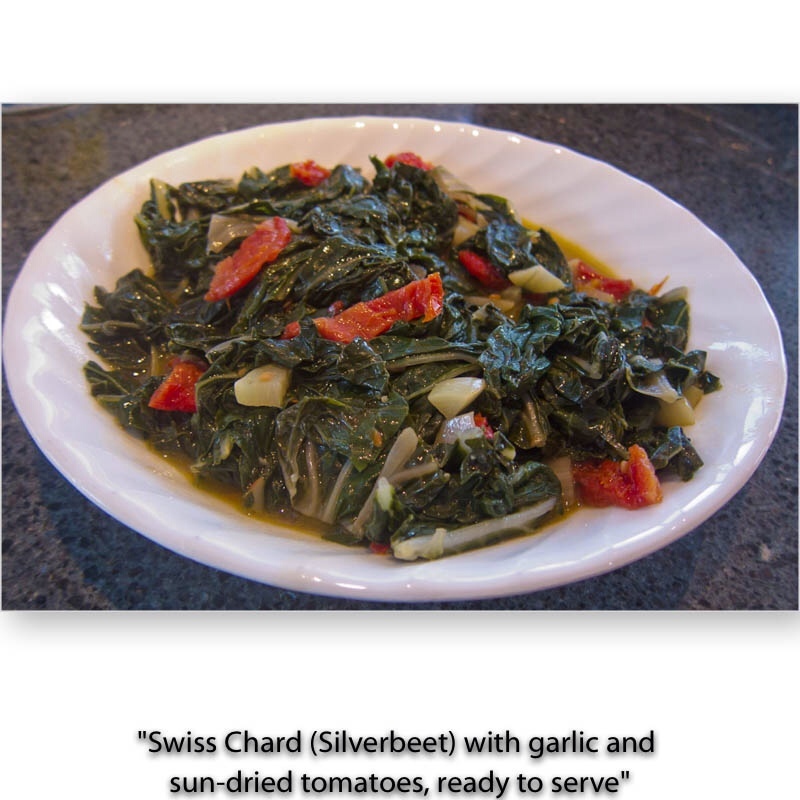 After about 3 minutes of steaming, open the lid and remove a piece of Chard with a fork. Allow to cool and taste for tenderness. 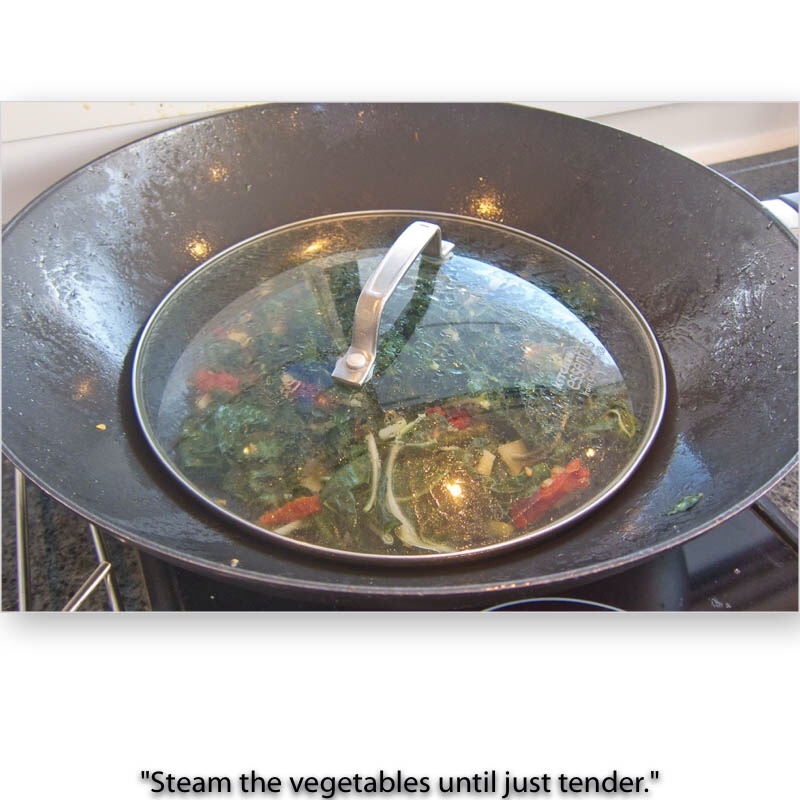 As soon as the Swiss Chard is tender, remove the Wok from the heat and pour the contents into a heated serving dish. Cover the serving dish with a heated lid until you are seated at the dining table and ready to eat. Heat the Oils in a large Wok or skillet. Add all ingredients except for Chicken Broth. Stir fry over High heat for 3 minutes, tossing the vegetables continuously, until Onions turn translucent. Place a lid over the contents of the Wok. 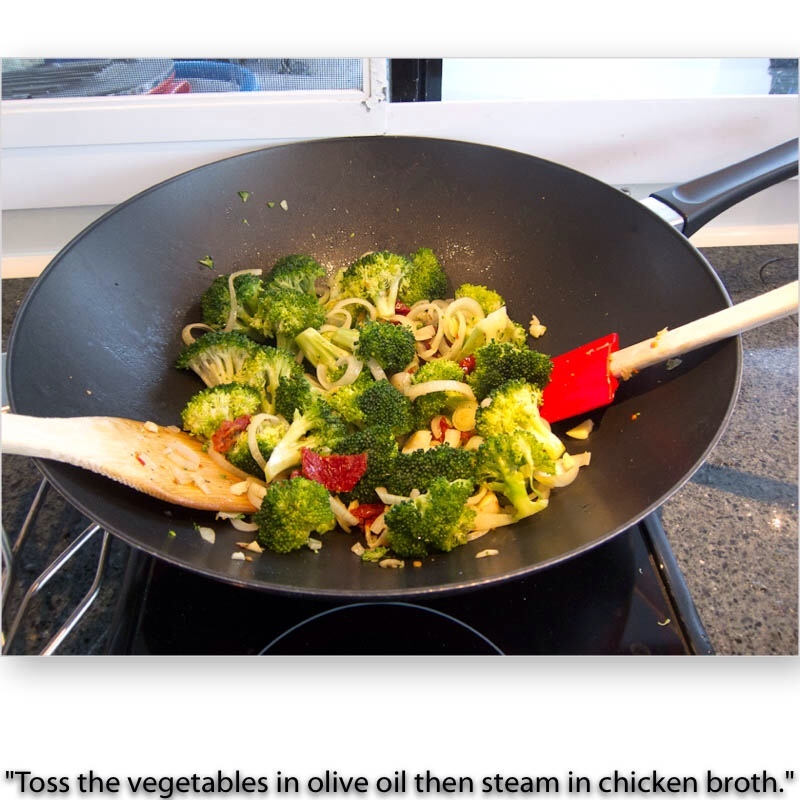 Turn the heat down to Medium Low and steam until Broccoli is al dente tender/crisp and bright green. Pour into a serving bowl and serve immediately. I really enjoy tossing a mixed salad in a large, wooden salad bowl. When we stayed with our friends, Joe and Kathy of S/V KATIEKAT, in California, we began each dinner meal with this salad. I do not own a lettuce spinner, so after cooling the lettuce in ice water, I spread the leaves out on a large, clean towel, wrap them up with the long ends of the towel exposed, and twirl the towel over my head like a cowgirl's lassoo, allowing centrifugal force to dry the lettuce. Store the towel and lettuce in the fridge until needed. Enough fresh mixed greens and/or baby spinach to serve the people at your table. Buffalo Mozarella balls — 1 per person, each cut into 4 pieces. Place the Lettuce and spinach into a large lettuce spinner and cover with cold water. Leave to soak and crisp while you make the Vinaigrette dressing. Place the Garlic, Salt and Pepper into a large salad bowl. With a wire whisk, stir rapidly until the Salt is dissolved. Pour in a tablespoon of the Olive oil and whisk vigorously. Continue to add the Olive oil, 1 tablespoons at a time, whisking vigorously after each addition. The Vinaigrette will begin to thicken slightly. Continue to whisk in all of the Olive oil until you have the amount of Vinaigrette to coat your lettuce and spinach. 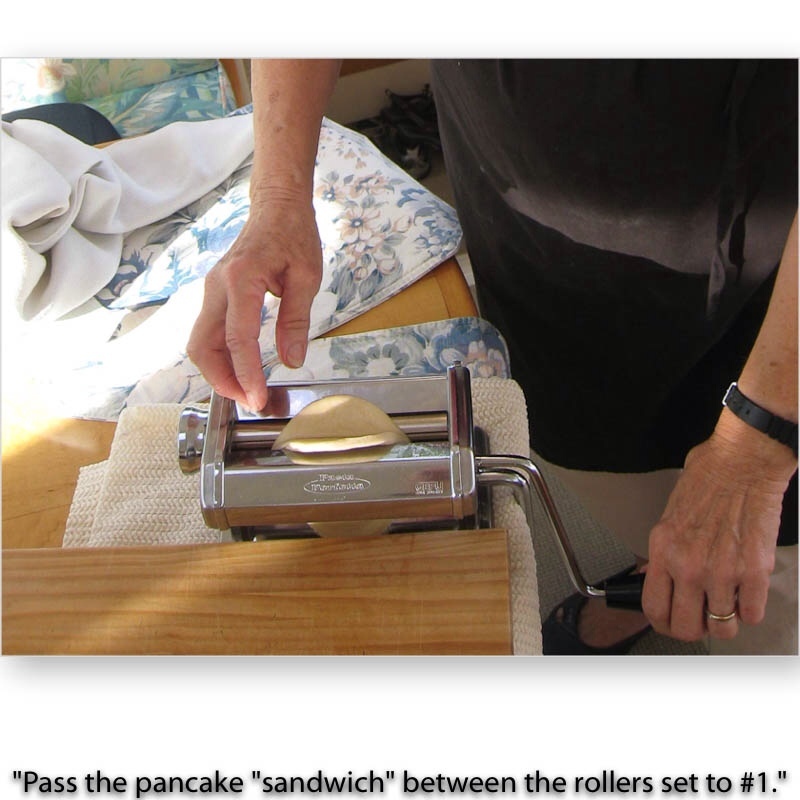 Just before serving, drain the lettuce and spinach and spin dry in the spinner. Place the lettuce and spinach in the salad bowl and toss to coat the leaves thoroughly with the Vinaigrette. Add the vegetables and toss thoroughly again. Scatter the Buffalo Mozarella pieces on top of the salad. When we left the US, there was basically no place to buy Heinz Chili Sauce, which has a special taste and texture. There are numerous recipes on the Internet, written by cooks who live in France, Brazil and other countries. This sauce has always been the basis for our Red Sauce for Seafood, primarily Prawns and Crab. It took us a few days of experimentation to come up with this recipe. Put all ingredients into a Food Processor and whiz until a thick sauce has formed. Combine the Flour and Milk in a mixing bowl, stirring until smooth. Add the Egg yolks and blend well. Coat the Blueberries with a bit of flour and white sugar. Add the Blueberries to the batter. Beat the Egg whites until softly stiff. Fold into the batter. Use 1/4 cup batter for each pancake and cook on a hot griddle, brushed with light oil or butter. 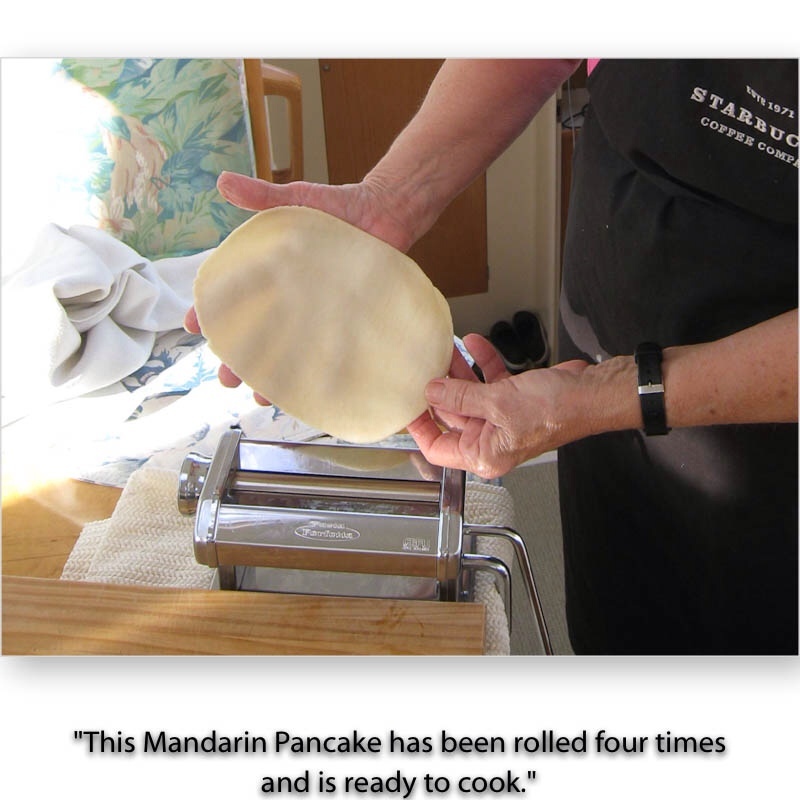 I cannot remember when or where I first tried this technique, but we used our pasta maker to roll out Mandarin pancakes for 7 people who joined us for dinner on Christmas day, 2012. The original recipe comes from “The Cooking of China”, Time, Inc., 1968. You cannot believe how simple, time-saving, and effective this technique is. Sift flour into a mixing bowl. Make a well in the center and pour the boiling water into it. With a wooden spoon, gradually mix the flour and water together until a soft dough is formed. On a lightly floured surface, knead the dough gently for 10 minutes, or until smooth and elastic. Cover with a damp tea towel and leave it for 15 minutes. On a lightly floured surface, roll dough into a circle about 1/4 inch thick. 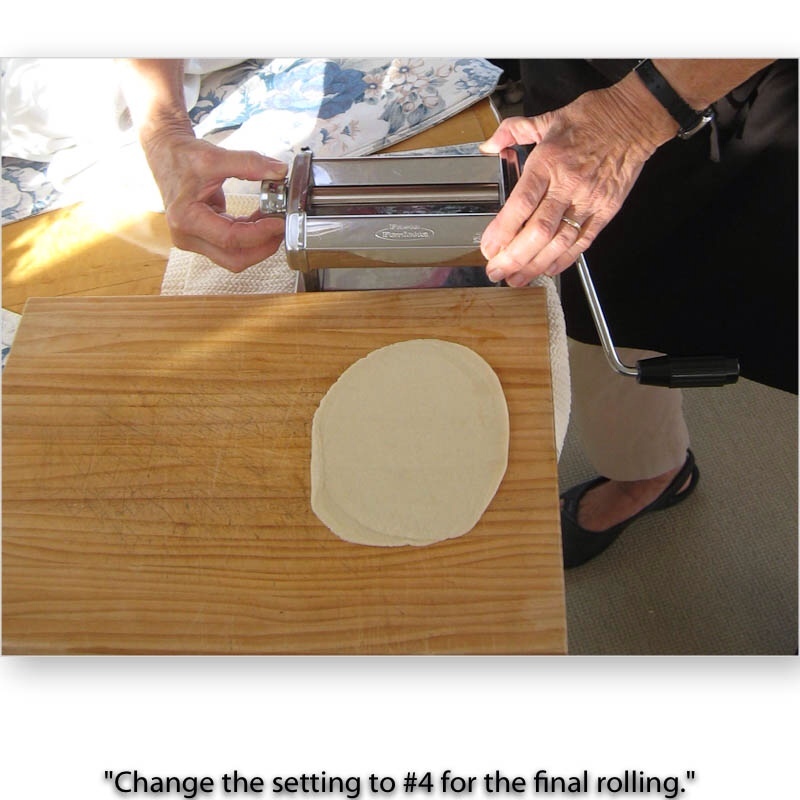 With a 2-1/2-inch cutter or a glass, cut out as many circles of dough as you can. Knead scraps together, roll out again and cut out more circles. Arrange the circles side by side, brush them all thoroughly one one side with sesame seed oil and place one circle on top of another, oiled sides together, making many little “sandwiches”. 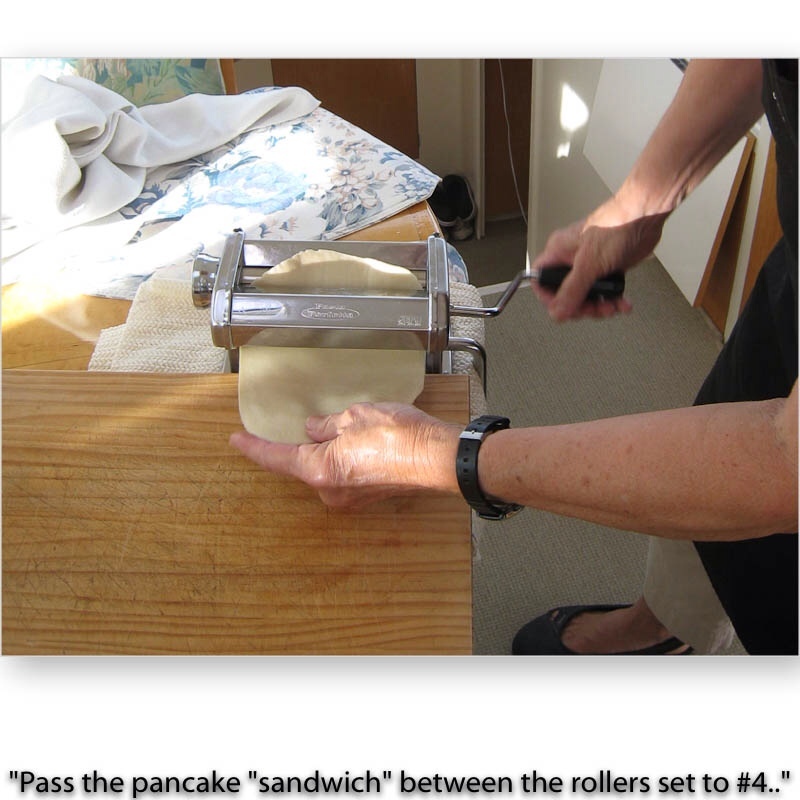 Set the pasta machine roller to #1 (thickest) and while turning the handle, feed the dough sandwich between the 2 rollers. 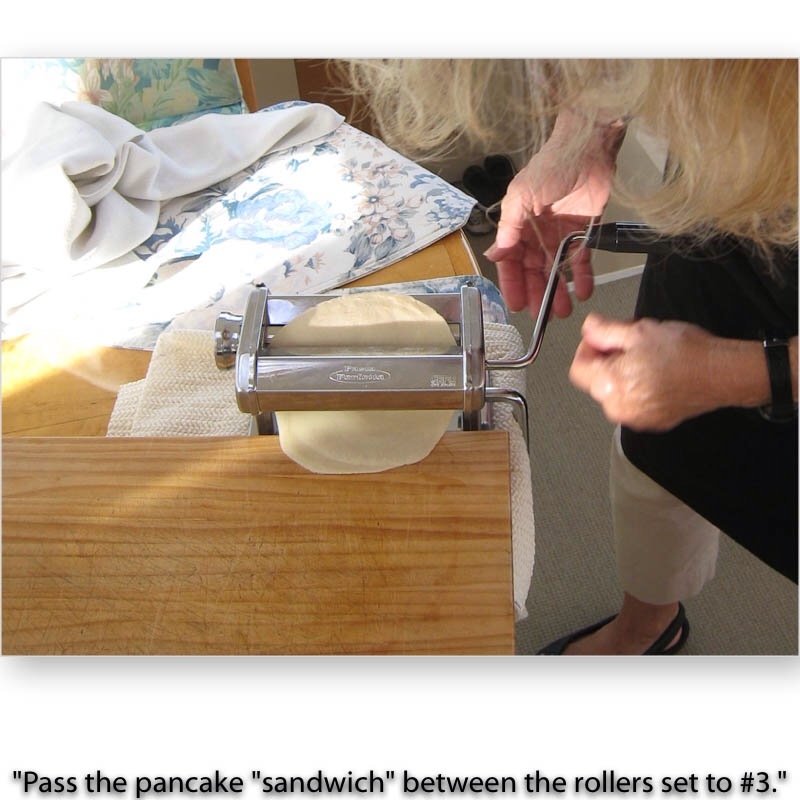 Set the thickness to #2, rotate the pancakes 90 degrees, and feed between the rollers. Continue with #3 and #4 thickness rollers. 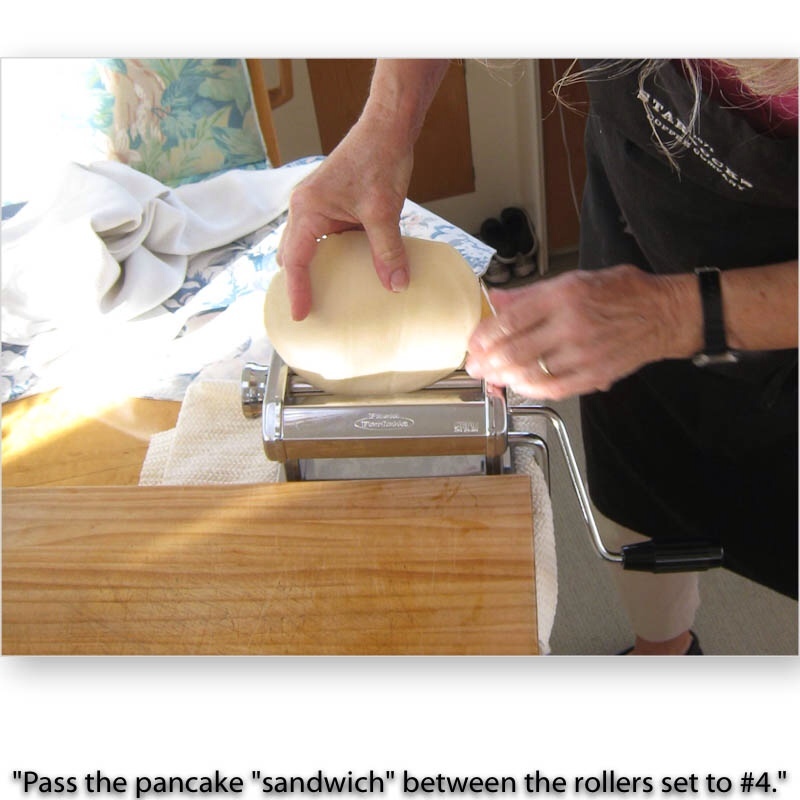 Keep the rolled pancakes covered with a dry tea towel as you make them. The pancakes will turn out to be exactly the right thickness, and very uniform. Don't worry if the pancakes become longer than wide. 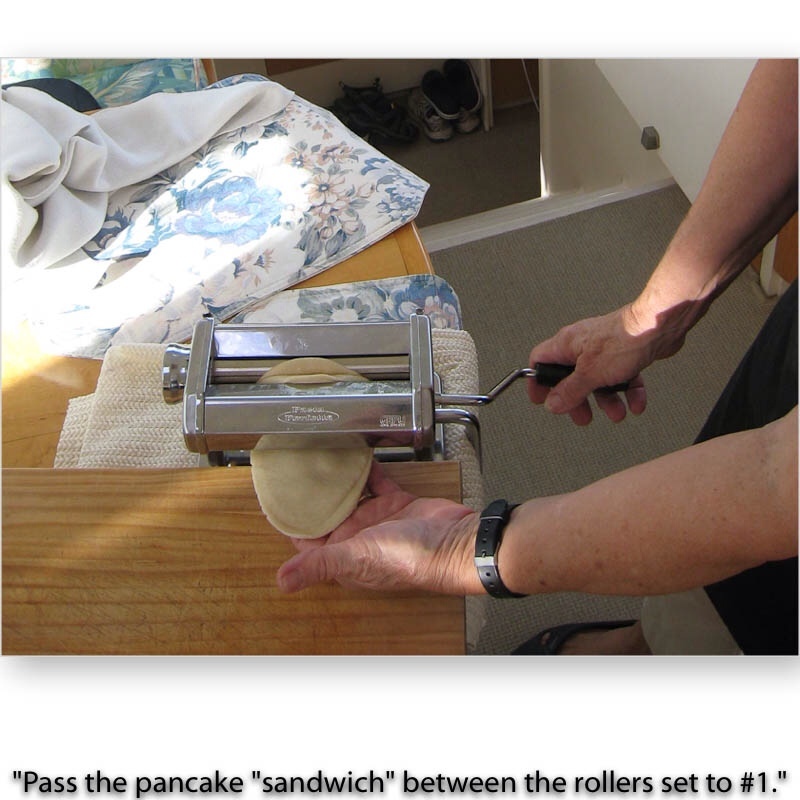 They cook quickly and can be easily separated, much more easily than the hand-rolled ones. Place a heavy fry pan, griddle or crepe pan over a high heat for 30 seconds. We set our electric crepe pan at 2-1/2. Reduce heat to moderate and cook the pancakes, one or more at a time, in the ungreased pan, turning them over as they puff up and little bubbles appear on the surface. Regulate the heat so that the pancakes become specked with brown after cooking about 1 minute or less on each side. Do not overcook. The pancakes will puff up with internal steam. You do NOT want to cook them until they are crisp. Remove the hot pancake from the pan and gently separate the 2 layers and stack them on a piece of aluminum foil large enough to wrap a stack of pancakes. Fold the corners of the foil over the top of the pancakes, so they don't dry out. Wrap up the pancakes in the foil in packs of about 14 pancakes. Continue to make the pancakes and wrap in foil until all of the dough is used. About 15 minutes before dinner is served, preheat the oven to 350 deg F or 180 deg C.
Place a packet of pancakes, still wrapped in their foil into the oven for 10 minutes. 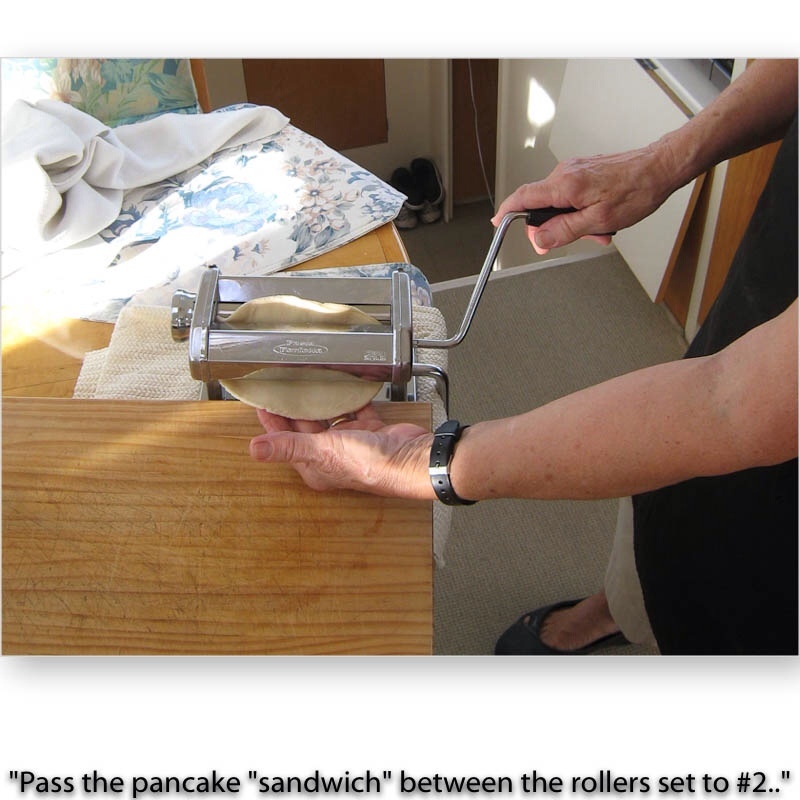 This is a two part process for cooking the pancakes. First, the skillet cooks them enough to be separated. Second, the oven completes the cooking of the pancakes. You can freeze the packs of pancakes wrapped in foil. To reheat them, no need to defrost the pancakes first. Cook in oven for 10 minutes as above. Quick and easy. We like the nutty flavor of the French Cheese called, “The Laughing Cow”, “La Vache Qui Rit”. It comes in wrapped, triangular portions. The recipe for Dukkah is on this web site. Triangles of The Laughing Cow Cheese, one per person, packaging removed and cut into three or four neat pieces. Dukkah spices, about a heaping teaspoon per person. I serve the cheese pieces on a plate, surrounding a small dish containing the Dukkah. Each person forks a piece of cheese and dips the cheese into the dish of Dukkah, attempting to coat the cheese on at least three sides. Quick to make, and easy for guests to handle. Arrange the Rice Crackers on a large plate. Place 1/2 tsp Hummus on each cracker. Place a medium-sized or 1/2 large-sized Basil leaf on top of the Hummus, and press down lightly. Cut the Grape Tomatoes in half. Place 1/2 of a Grape Tomato, cut side down, on top of each Basil leaf.